Every once in a while a reader will ask for a specific recipe that stumps us. 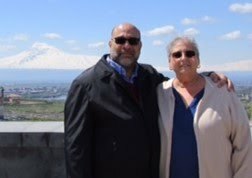 This time the request came from distinguished author, physician, and instructor, Dr. Carolann S. Najarian, (http://najarian.info/about.htm). One passage, which makes a clear reference to 'surum', was written during her visit in Kharpert. 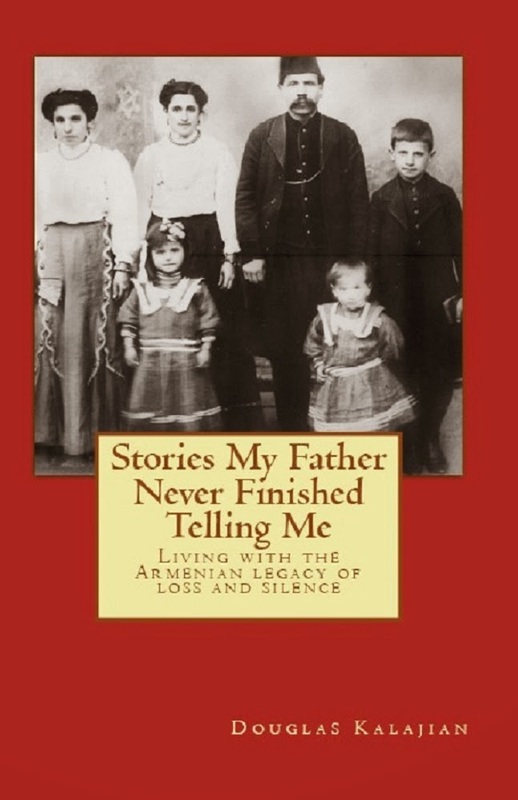 "Armen had already told us two local specialties would be served – Kharpert kufteh and surum! Surum! My aunt Hasmieg and I couldn’t wait! For years we have enjoyed surum (or serim) in our family, but today, few people are familiar with this dish – it is not in any recipe book or on any menu. It is a forgotten food! Hasmieg and I simply could not believe that surum was here, in this desolate town. During the summer, on the days our grandmother baked the flat round bread on the sheet of zinc – the sahje – over the outdoor fire, she would make surum for lunch. Some of the flat rounds of bread would be cooked until thoroughly dried and hard making it possible to store the breads for weeks while others were taken off the sahje while still soft. These she rolled and placed in a large baking pan layered with garlic, butter, and with her own madzoon (yogurt), and then baked. This is surum!" After searching through my resources, I found a recipe called 'Surrum' in the cookbook, Treasured Armenian Recipes. The dough preparation is labor-intensive, but back-in-the-day there were no grocery stores with ready-made pasta, so everything was made from scratch. I could envision a group of village women helping each other to make the dough. After all, it couldn’t possibly have been a one-person operation! When reading the recipe below, don’t be put-off by the directions. In case this recipe sounds appealing but you don’t have the time or interest in making homemade pasta, I’m adding a time-saving version of this recipe at the end of this post, thanks to my Aunt Arpie. Remember her? She’s the one from our video on "How to make Boorma". 1. Make a dough of the above ingredients. 2. Divide dough into 15 equal pieces. Place on a baking sheet and cover with a damp cloth. Let stand for ½ hour. 3. Roll out each piece with a long type rolling stick to same size as the inside space of your oven. Sprinkle flour when rolling. 5. Bake ½ minute on one side; turn over and bake another ½ minute on the other side. Leave door open while baking to keep dough soft and not browned too much. 7. Continue the same process with the remaining pieces of dough. 8. Pile all the strips on top of each other. Cut the pile into 2 inch long pieces. 9. Arrange these pieces in a pan close to each other with the cut sides up to let sauce run down. 1. Prepare sauce by heating the madzoon mixed with salt. If madzoon is too thick, dilute with a little water. 2. Then blend the melted butter with madzoon. (If using garlic, it can be thinly sliced and sauteed in the butter.) While hot, pour sauce over the dough on the pan and serve immediately. 1. Sauté 2 to 3 cloves of thinly sliced garlic in 4 Tbsp. butter until garlic is soft. Cool slightly. 2. Stir in 1 to 1 ½ cups plain yogurt. Set aside. 3. Boil ½ lb. shell-shaped pasta according to package directions. Drain. 4. 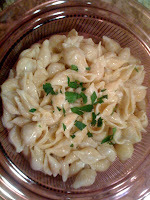 Place cooked pasta in serving bowl; toss with garlic-yogurt sauce. 5. Season with salt and pepper, if desired. Garnish with chopped parsley (optional). NOTE: You can use any shape pasta you like, but Aunt Arpie recommends the shell-shaped pasta because the sauce collects inside each shell for a deliciously tangy bite. Oh, and eat this with a spoon! Thanks for the link to Dr. Najarian's page, Robyn. I am very happy to have "met" her and learned of her work through your site.